THE PROTESTS in Iran have been dubbed the “Twitter Revolution’’ because the latest social-networking tools proved useful in organizing demonstrations and uploading eyewitness texts, images, and videos to the Internet. Indeed, the shooting death of 26-year-old Neda Agha Soltan became an icon after the “citizen journalist’’ who captured it on video sent the link to a friend outside Iran, who posted it on YouTube and forwarded it to the Persian-language service of the Voice of America. Finally, at the end of what is now a turbo-boosted news cycle, the video appeared on CNN. But what if this sudden deployment of media technology doesn’t move the regime? It’s tempting to conclude that information technology will automatically liberate the world, and all Americans need to do is keep on producing and selling it overseas. But there are two problems with this. First, the same technology that empowers the individual also empowers the state - sometimes with American help. True, the Office of the US Trade Representative and the Commerce Department lodged a complaint Wednesday with the Chinese government about a rule requiring website-blocking software in all computers sold in China. But this is a departure from the usual pattern by which companies such as Cisco, Google, and Yahoo have cooperated with censorship, then defended their actions as the cost of doing business with Beijing. Similarly, Freedom House reported recently that Iran’s “automated filtering’’ of the Internet is “enabled by SmartFilter, a commercial content-control software system developed by a US-based firm.’’ The company contends that the software is pirated, but that is irrelevant to the larger point, which is that there is nothing inherently liberating about state-of-the-art information technology. Like all previous tools, it is only as benevolent as the human beings who use it. Second, many Americans assume that massive media exposure will automatically lead to positive change. Yet this requires responsive and accountable political institutions, which are clearly lacking in Iran. It also requires a consistent flow of information that sustains a view of the world different from the regime’s. But right now, Tehran is carrying out a bloody crackdown that combines old-fashioned brutality with newfangled censorship. 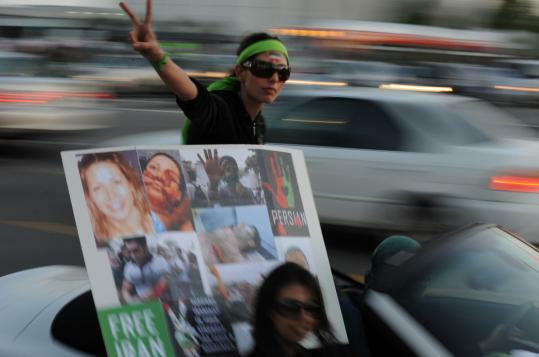 Worst of all, the Iranian protesters cannot command the world’s attention indefinitely. As the regime chokes off all cross-border communication, CNN will move on to other more telegenic topics. In addition to imprisonment and other abuse by the authorities, thousands of Iranians will suffer the pangs of obscurity. In this they are not alone. Human rights activists languish in many countries where the CNN spotlight rarely shines. Some of these countries are of little strategic interest to America or its adversaries. Others are too poor to attract commercial media. But there is a way for America to connect with these populations. Like the BBC, Voice of America broadcasts news and information in 45 languages around the world. And its “surrogate’’ counterparts, Radio Free Asia and Radio Free Europe/Radio Liberty (which broadcasts into Central Asia and the Middle East), use a variety of media platforms, from shortwave radios to social-networking tools on the Internet, to send reliable news to millions of people whose own media are censored. In Iran, the Persian-language service of Radio Free Europe/Radio Liberty uses several different radio frequencies and the Internet, while Voice of America’s Persian television service claims to reach more than 15 million viewers. Accurate audience measures are hard to come by in places like Iran. But the fact that Tehran spends a huge amount of money jamming these channels and blocking their websites tells us something. These broadcast services are not well known to Americans, because of a 1948 law that forbids the domestic dissemination of all material created for foreign audiences. But this law is now moot, because like everyone else, Americans can access these services online. Do so, and you will see that, contrary to what many assume, these channels do not merely broadcast US government propaganda. Nor do they follow CNN and other “global’’ media in hopscotching between hot spots. On the contrary, these channels maintain a consistent, steady presence, outwitting the censors and keeping brave reporters on the ground, so that the people living in those countries can know what is going on, even when the whole world is not watching. Martha Bayles teaches in the Arts and Sciences Honors Program at Boston College and is writing a book about America’s cultural image.